Volvo will sell you a very sleek and stylish 2018 V90 wagon, but you will have to order it. The starting MSRP for some Swedish longroof goodness is just under $50,000, but once you start checking option boxes this can be one pricey wagon. If you want to buy a Volvo wagon off the showroom from your local dealer you will have to stick with the V90 Cross Country. The V90 XC is an excellent choice that rides a little higher, and has a more rugged look. However, some of you who are wagon purists may be a bit turned off by a wagon masquerading as a crossover. 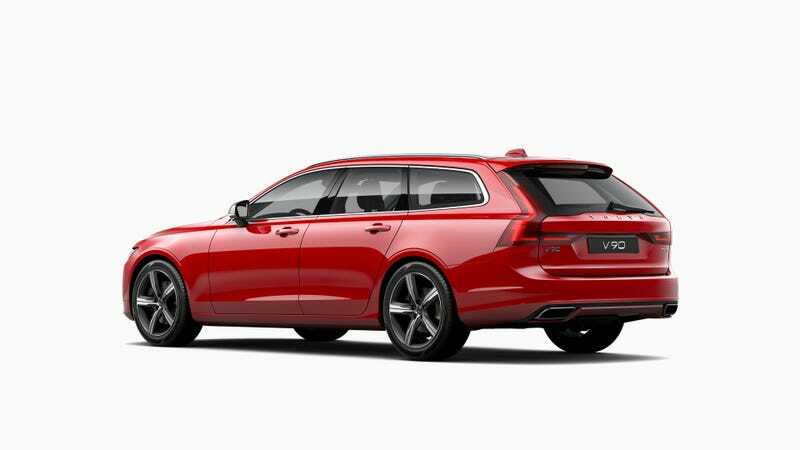 You folks will have to pony up the cash and custom order V90 from the factory, and perhaps take a lovely vacation to Sweden to go pick it up. Volvo just launched the U.S. configurator for the V90, so feel free to waste away whatever productivity you had today building your own Swedish longroof. You can have your V90 in only two flavors, the sporty R-design, or the luxurious Inscription. A two-wheel drive 250 horsepower T5 R-design will start at $49,950 before options and destination fee while upgrading to the 316 HP AWD T6 will set you back $55,950. Choose the Inscription model and you will have a starting price of $51,950 for the T5 and $57,950 for the T6. Like most other European brands, Volvo charges a premium of a few thousand dollars if you prefer a wagon over the sedan, but you’ll save a few bucks by getting the regular V90 over the Cross Country.